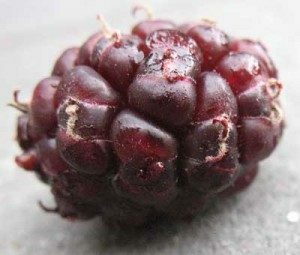 Black Mulberries (latin name Morus nigra) are so ripe and juicy that they just melt in your mouth. This is a bumper year for mulberries. The trees are laden and the fruit is of excellent quality. The tree in this picture was grown from a cutting – the mother tree was in Patrington Rectory. So many mulberries are found in Rectories. The story is that Queen Anne decreed that all rectories should have a mulberry tree – to support the silk trade! Silk worms feed on the mulberry leaves. 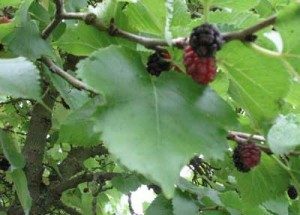 There is a mulberry tree in the grounds of Wilberforce House, close to the River Hull, in Yorkshire. Perfectly shaped, knarled and old, it crops well. Wilberforce House in Hull is the birthplace of William Wilberforce. William Wilberforce led the long and arduous campaign against the slave trade, which resulted in the abolition bill in 1807. 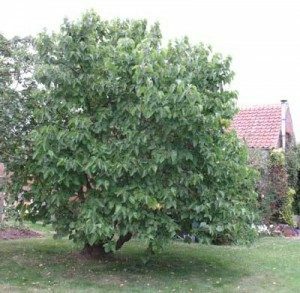 To mark this important anniversary a mulberry tree was planted on the edge of our veg patch in 2007. The mulberry tree in the garden will attract birds which will help keep down the insect pests. 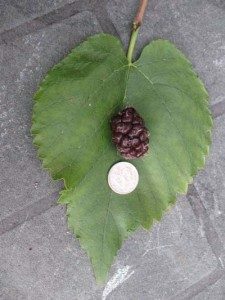 Mulberries are adaptable and do well in more marginal soils and climates. 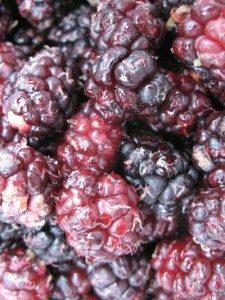 We will certainly be able to feed on the juicy mulberries picked from our tree, that we have put in the freezer over the winter!